A grid-tie system can be battery-less or have a back-up bank of batteries to store energy until needed. A battery grid-tie system can sell power back to the Grid. With a battery-less system, once the grid-supplied power goes out due to a storm, damage to the power lines, or utility malfunction, the user has no Power for normal loads such as lights, furnace fans, or refrigerators, loads which could be powered by batteries for a limited amount of time. Battery back-up will maintain comfort and circuits powering important loads. There is a difference in cost between a battery-less grid-tie system and one with battery back-up. A battery-less system requires an inverter and a solar array or other renewable power source. In addition to these two Components,a battery grid-tie system requires several batteries, a charge controller for efficient battery recharging, breaker panels, circuit breakers, and enclosures to house the components. Each system will have installation expenses. A grid-tie system with battery back-up adds as little as 12% cost over a stand-alone grid-tie system. Net metering is a billing mechanism that actually credits solar system owners for the electricity they add to the grid. 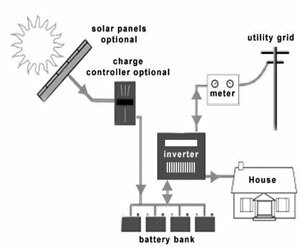 This can be further explained with the following example: if a residential customer has a solar energy system on their home’s rooftop, chances are it will or it should generate more electricity than the home uses during the day. If the home is net-metered, the electricity boxes meter will actually run backwards which in turn provides credit against what electricity is used at night. To further explain this, net metering allows you to have only one electric meter which can spin forward or backward at the same rate. When the sun is shining, your solar system is producing electricity that can be directly used by your home or business, thereby offsetting the amount of electricity being purchased from the utility company. When your PV system is producing more energy than the home needs, then the electricity is actually sold back to the utility company, causing your electric meter to spin backwards to give you a retail credit. It’s definitely not uncommon for us to receive a couple of calls a day about our customer’s excitement when they see the meter fun backwards. 1. Generated energy from the SRTPV system is first consumed (self-consumption) by the loads of the building (lights, fans, appliances, etc.). If the SRTPV generated energy is more than the building loads consume, the surplus energy will automatically be exported to the Grid distribution network (the grid). If there is less solar energy generated than the loads of the building requirement, the shortfall energy will be drawn from the grid (energy import). 5. The Applicant has to procure bi-directional meter from any of the approved vendors as per CEA guidelines. 6. The rooftop/terrace must have easy access. 7. The applicant should be the owner of the property or authorized person. If the property is in the name of the Company, Trust, Co-operatives / partnership firms, then authorization shall be assigned to a person for correspondence, paperwork, execution of various agreements, etc. Such person must be authorized by the management of the organization. In case of partnership firms, the authorized signatory must be one of the partners, to whom written consent has been given by the other partners. 8. If consumer is not availed subsidy, shall furnish self-certification for not availing subsidy from MNRE. 9. Application registered is not transferable. 10. Net metered energy means: The difference of meter readings of energy injected by the SRTPV system into the grid (export) and the energy drawn from the grid for use by the seller(import) recorded in the bi-directional meter. 11. The tariff for injecting surplus energy by rooftop installation will be as per the prevailing tariff determined by KERC from time to time. (At present the tariff is Rs.9.56 per unit for installations without subsidy and Rs.7.20 per unit for installations with subsidy upto 31st March 2018). 12. n case the installed (also read proposed) capacity of the SRTPV system is higher than the sanctioned load of the consumer, which may consequently requires an up gradation in the infrastructure (service line, meter with CT (if required), transformer up gradation (if required)), the consumer will have to upgrade at his/ her/ its own cost under prevailing conditions of deposit contribution work. For further information regarding up gradation of infrastructure can be obtained from AEE(Ele,), C, O&M, sub-division Office, THE ELECTRICITY COMPANY. 1.Copy of the latest Electricity bill. 2.Authorization letter Format-1A in case of Company/Trust/Co-operatives/ Partnership and Format -1B for Partnership firms. 3.Copy of the Subsidy sanction letter from MNRE/ self-certification for not obtaining MNRE subsidy Format -1C. 15. If, the existing power supply of the consumer is of single phase and wishes to apply for three phase SRTPV system, installation shall be sanctioned from AEE, C,O&M Sub-division before applying. Otherwise the application will be rejected. 16. The Applicant shall install the meter of SRTPV system and bi-directional meter in separate meter boxes in the same proximity or at a suitable place in the premises accessible for the purpose of recording the reading. 17. Solar meter reading will be taken for statistical purpose only and not for billing. 18. Subsidy: The Applicant can avail MNRE subsidy of 30% on the capital cost of the Solar rooftop PV systems. 1.THE ELECTRICITY COMPANY will issue monthly electricity bill for the net metered energy on the scheduled date of meter reading. 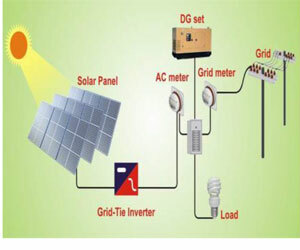 2.In case, the exported energy is more than the imported energy, THE ELECTRICITY COMPANY shall pay for the net energy exported after self-consumption as per Tariff agreed in the agreement within 30 days of issue of bills duly adjusting the fixed charges and electricity dues if any and credited to the bank account through NEFT. 3.In case, the exported energy is less than the imported energy, the SRTPV consumer shall pay THE ELECTRICITY COMPANY for the net imported energy as per the prevailing retail supply tariff determined by the commission from time to time.